AffordableArt101 is your best source of art prints for sale online. We specialize in offering rare prints by famous artists at wholesale prices. Just in: art by Charles Daubigny, James Whistler, Josef Albers, Egon Schiele, Henri Matisse, Jean-Paul Riopelle, Andre Derain, Eduardo Chillida, Antoni Tapies, Sonia Delaunay, Robert Motherwell, Wassily Kandinsky, Maria Elena Vieira da Silva, Henri Michaux, Pablo Picasso, Sophie Taeuber-Arp, Pierre-Auguste Renoir, Paul Klee, Marc Chagall, Maurice Utrillo, Charles Dufresne, Henri Manguin, Joan Miro and Marcel Duchamp. Fresh art work inventory arrives frequently. BOOKMARK THIS PAGE to add us to your favorites and check back every week to see what's new. Abstract, Minimalist and Mid-Century Modern Art -- an Interior Designer's dream! Affordable Art 101 has a fine and robust collection of original Abstract Art from several schools, including Abstract Expressionism (and its French equivalent Tachisme), Minimalism, Hard Edge and Op Art (Optical Art). 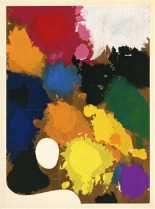 Within the Affordable Art collection of abstract artists are Sam Francis, Ellsworth Kelly, Joan Mitchell, Kenneth Noland, Josef Albers, Alexander Liberman, Andre Bloc, Auguste Herbin, Nicholas Kruschenick, Robyn Denny, Olle Baertling. Other fine abstract artists whom we feature online include Sonia Delaunay, Richard Mortensen, Alexander Calder, Antoni Tapies, Jean Fautrier, Serge Poliakoff, Pierre Soulages, Karel Appel, Alberto Magnelli, Robert Motherwell, Paul Mansouroff (Pavel Mansurov), Jean-Paul Riopelle, Victor Vasarely, Yaacov Agam, Richard Anuszkiewicz, Paul Jenkins and many other artists are featured in our abstract art gallery. 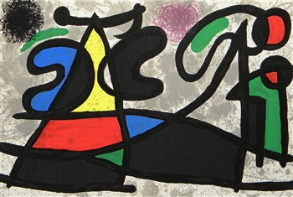 We offer an excellent collection of Joan Miro art, and many of the Miro lithographs of the 1960's and 1970's fit well within the category of abstract art. Iconic works by Warhol, Lichtenstein, Indiana, Johns, Wesselmann and others. Pop Art is a perennial favorite at Affordable Art 101 – we offer fine art prints at sale prices, indeed the lowest you’ll find from any print dealers. We feature Andy Warhol, Roy Lichtenstein, Tom Wesselmann, Robert Rauschenberg, Jasper Johns, Mel Ramos, Robert Indiana, Claes Oldenburg, Enrico Baj, James Rosenquist, Jean Dubuffet, Richard Lindner, Paul Wunderlich, Man Ray, Jim Dine and other artists associated with the Pop Art movement. Along with American Pop Art, included in Affordable Art’s collection are works by European artists of the Situationist movement, such as Asger Jorn, Reinhoud and Peter Klasen. Among our most popular Pop Art prints for sale are the bold and iconic compositions of Andy Warhol. Avant-garde art by Picasso, Braque, Leger, Villon, Delaunay and more. Initiated by Picasso art work and others, Cubism was one of the most innovative and creative movements of Modern Art. 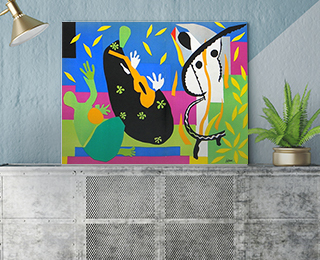 Affordable Art 101 features Pablo Picasso art work along with pieces by Juan Gris, Georges Braque, Fernand Leger, Jacques Villon, Robert Delaunay and his wife Sonia Delaunay. Additionally, we’re one of few online print dealers carrying artwork by Auguste Herbin, Henri Laurens, Alexander Archipenko, Marie Laurencin, Louis Marcoussis, Andre Lhote, Georges Valmier, Albert Gleizes, Charles Lapicque. Other printmakers associated with the Cubist School that Affordable Art 101 offers include Italian Futurists Gino Severini and Giacomo Balla. Yet another style of art influenced by Cubism that we offer is Neoplasticism, also called De Stijl. Our collection of Cubism embraces other related art movements, including authentic Picasso art work of various periods. 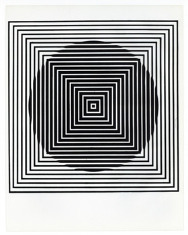 Magnificent German Expressionist and Bauhaus prints by Kandinsky, Klee, Albers and many more. We have a excellent selection of German Expressionist prints. This includes works by artists from Die Brücke (The Bridge) school such as Erich Heckel, Karl Schmidt-Rottluff, Max Pechstein and Edvard Munch are offered here. We offer prints from the Berlin Secession group of artists, which included Kathe Kollwitz, Hermann Struck, Lyonel Feininger and Lovis Corinth. 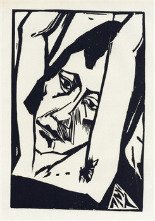 Many other printmakers associated with German Expressionism are also featured, such as Heinrich Campendonck, Felix Meseck, Max Kaus, Rudolf Grossmann, Alexander Kanoldt, Andre Rouveyre, Ingaz Epper, Karl Hofer, Edwin Scharff, Max Beckmann, Georg Ehrlich, Otto Dix, Conrad Felixmuller, Richard Seewald, Karl Rossing, Max Burchartz, Heinrich Nauen, Eberhard Viegener, Rudolf Grossmann, Walter Ruttmann, Franz Hecht, Wilhelm Plunnecke, Paul Kleinschmidt, Karl Caspar, Otto Gleichman, Ernst Barlach, Max Unold and Richard Seewald. Der Blaue Reiter (The Blue Rider) group centered around Franz Marc and Wassily Kandinsky, who is a favorite at AffordableArt101. Although German Expressionist printmakers employed various media, they excelled especially at the introduction of the woodcut into Modern Art. The Bauhaus School was an important offshoot of Expressionism, and we are pleased to include Bauhaus artists Josef Albers, Lyonel Feininger and Paul Klee. Striking and fanciful creations by Dali, Miro, Ernst, Tanguy, Arp and more. A few philosophical revolution expressed through artwork, Surrealism is characterized by a lack of logic and the unexpected. At Affordable Art 101 we offer Surrealist prints by Joan Miro, Yves Tanguy, Max Ernst, Hans Bellmer, Dorothea Tanning, Rene Magritte, Marie Toyen, Kay Sage, Jacques Herold, Andre Masson, Victor Brauner, Giorgio de Chirico, Roberto Sebastian Matta, Wifredo Lam and Marcel Jean. 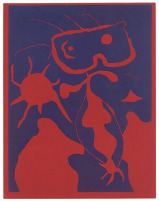 Other affordable art from the Surrealist movement include works by Alexander Calder, Bruno Capacci, Elisabeth van Damme, Julio de Diego, Enrico Donati, David Hare, Jacqueline Lamba, Man Ray, Alberto Giacometti and of course the well-known Dada / Surrealist printmakers Jean Arp (also known as Hans Arp), Francis Picabia and Marcel Duchamp. 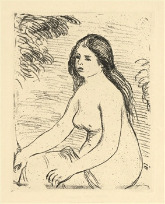 Original prints by Renoir, Manet, Cezanne, Pissarro and other Impressionist Masters. Instigated in the 1800s by artists based out of Paris, Impressionism became a hugely influential and popular style of art. Affordable Art 101 features original etchings by Impressionist artists Pierre-Auguste Renoir, Edouard Manet, Johan Barthold Jongkind, Alfred Sisley, Jean-Louis Forain, Camille Pissarro, Childe Hassam, George Elbert Burr, Max Liebermann, Armand Guillaumin and William Merritt Chase. Also included and affordably priced are some stunning prints after Claude Monet, Edgar Degas and Mary Cassatt. 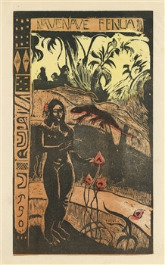 See our outstanding collection of 19th Century etchings, aquatints, lithographs and mezzotints. Affordable Art 101 offers a rich selection of European etchings from the 19th Century and earlier. This important collection includes Old Master etchings by Rembrandt van Rijn, Jacques Callot, Salvator Rosa, Anthonie Waterloo, Franz Edmund Weirotter, Karl Dujardin, Jan Both, Annibale Carracci and Giovanni Benedetto Castiglione. Here you'll find Barbizon School art by Charles Daubigny, Jean-Francois Millet and Jean-Baptiste-Camille Corot. We feature antique prints from other 19th Century etchers including Anders Zorn, Jules Bastien-Lepage, Paul Cesar Helleu, Eugene Boudin, Stanislas Lepine, Felix Bracquemond, James Tissot, Eugene Delacroix, Charles Meryon, Theophile Chauvel, Francisco Goya, Johan Barthold Jongkind, Maxime Lalanne, Jean Leon Gerome, Alphonse Legros, Edgar Chahine, Jean-Louis Forain and Felix Buhot. Many of these antique printmakers, along with Parisian artist Auguste Delâtre, helped start the French Etching Revival. We offer great sale prices on these important antique art prints online at Affordable Art 101. Art by the Post Impressionists, Symbolists, Fauvists and Les Nabis. Henri de Toulouse-Lautrec and Paul Gauguin are two post-impressionistic artists that Affordable Art 101 features in our post-impressionism art collection. The art prints are on sale here include a well-rounded representation of Fauvism, with an exceptional collection of fine prints by Henri Matisse, in addition to works by other Fauvist art legends including Maurice de Vlaminck, Andre Derain, Georges Braque, Raoul Dufy and Georges Rouault. We also offer some fine art prints by the group of revolutionary French painters known as Les Nabis artists; included are pieces by Pierre Bonnard, Felix Vallotton, Maurice Denis, K X Roussel, Edouard Vuillard and Aristide Maillol. Picasso, Chagall and other Modernist Masters of the Ecole de Paris. Our collection of art prints in the École de Paris, or School of Paris, collection embraces a broad range of the Modern artists who worked in Paris during the mid-1900s. Among these, Pablo Picasso art work is proudly featured in this collection, as well as our Marc Chagall lithographs, Matisse prints and other pieces of fine art. These examples of Picasso art work and original Chagall lithographs form the foundation of our School of Paris pieces. Other Modern Masters of the graphic arts are represented here, such as Jean Dubuffet, Nicholas de Stael, Serge Poliakoff, Bernard Buffet, Hans Hartung, Bram van Velde, Henri Michaux, Alfred Manessier, Marcel Vertes, Jean Cocteau, Louis Icart, Jean Fautrier, Pierre Soulages, Maria Elena Vieira da Silva, Charles Lapicque, Pierre Tal-Coat, Zao Wou-ki and many others. 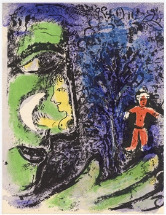 Note: to view the complete selection of our Chagall lithographs and Picasso art work, please click on the index at left. 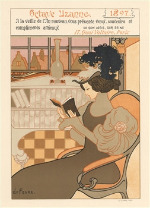 Great deals on vintage French posters. Our collection includes original posters and various vintage replicas of French posters from the Belle Epoque, and beautiful mid-century lithographs printed by Mourlot after posters by Picasso, Chagall, Braque, Miro and other modern artists. A great savings on some very nice prints! Medium: original color woodcut. Catalogue reference: Dube 259 ii B. Printed in Germany in 1925 for the rare Ganymed "Das funfte Jahrbuch der Marees Gesellschaft", published in Munich by Marees-Gesellschaft, R. Piper & Co. The woodcut was printed by Fritz Voigt, of Berlin. This is a good, dark impression on wove paper from the unsigned edition of 900 (the total edition was 1000, of which 100 were signed). The image measures 7 1/8 x 4 1/8 inches (180 x 105 mm) with full original margins. In fine condition. This piece is in the permanent collection of MoMA (The Museum of Modern Art). 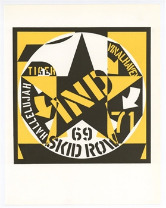 An important German Expressionist print offered at an attractive price. Not signed. Medium: engraving in the Crayon Manner (also know as the Chalk Manner). This rare and beautiful engraving by Louis-Marin Bonnet employed a technique used before the advent of lithography, using three plates (black, red chalk and white chalk) to achieve the soft and subtle effect of a chalk drawing. Size: 17 1/2 x 13 1/2 inches (image); not including margins. Printed in Paris in 1772. Condition: there is a small repair to the margin and a few areas of minor wear and creasing to the paper; one spot of foxing to the left of the image and a mat stain (in good condition overall for its age). Pierre-Auguste Renoir etching "La femme a l'eventail"
Medium: etching (after the painting). This beautiful piece was etched by Auguste Lauzet after Renoir, and published in Paris in 1892 by Chamerot et Renouard, for the very rare volume "L'Art Impressionniste", featuring etchings after important artworks in the private collection of M. Durand-Ruel, which was at the time was one of the world's foremost collections of Impressionist art. This print is a fine impression printed on cream laid paper, with a platemark (not shown here in this photo) and good margins; the plate measures 5 3/4 x 4 5/8 inches. Not signed. A nice find, with no others currently offered on the market. Welcome to AffordableArt101. We're the best source for affordable art prints and we hope to be your preferred place to buy art online. As print dealers since 2005, we specialize in works of the 19th and 20th Century Masters, proudly offering etchings, silkscreens, lithographs, woodcuts, pochoirs and other fine prints to our growing number of loyal art-buying clients around the world. Our vast selection includes prints from Old Masters' works to Modern and Pop Art prints. Please see the artist index at left, with master prints from more than 450 artists whose works we currently offer, with more coming in all the time. If you've ever dreamed of owning an original Chagall or Calder, we have lithographs for sale depicting these artists' genius that you can affordably own and enjoy. Picasso or Renoir? Our etchings and lithographs are priced far below retail and other art dealers often buy art prints from us for resale in their galleries.